Illustrations: 45 color illus., B&W illus. Published on the occasion of the expo's 75th anniversary, Into the Void Pacific is the first architectural history of the 1939 San Francisco World’s Fair. While fairs of the 1930's turned to the future as a foil to the Great Depression, the Golden Gate International Exposition conjured up geographical conceits to explore the nature of the city's place in what organizers called "Pacific Civilization." 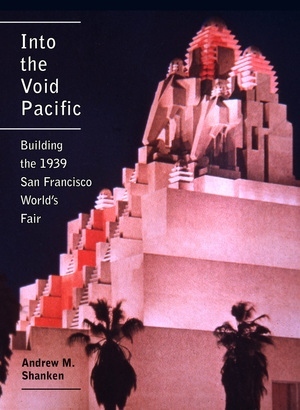 Andrew Shanken adopts D.H. Lawrence’s suggestive description of California as a way of thinking about the architecture of the Golden Gate International Exposition, using the phrase “void Pacific” to suggest the isolation and novelty of California and its habit of looking West rather than back over its shoulder to the institutions of the East Coast and Europe. The fair proposed this vision of the Pacific as an antidote to the troubled Atlantic world, then descending into chaos for the second time in a generation. Architects took up the theme and projected the regionalist sensibilities of Northern California onto Asian and Latin American architecture. Their eclectic, referential buildings drew widely on the cultural traditions of ancient Cambodia, China, and Mexico, as well as the International Style, Art Deco, and the Bay Region Tradition. The book explores how buildings supported the cultural and political work of the fair and fashioned a second, parallel world in a moment of economic depression and international turmoil. Yet it is also a tale of architectural compromise, contingency, and symbolism gone awry. With chapters organized around the creation of Treasure Island and the key areas and pavilions of the fair, this study takes a cut through the work of William Wurster, Bernard Maybeck, Timothy Pflueger, and Arthur Brown, Jr., among others. Shanken also looks closely at buildings as buildings, analyzing them in light of local circumstances, regionalist sensibilities, and national and international movements at that crucial moment when modernism and the Beaux-Arts intersected dynamically. Andrew Shanken is Associate Professor of Architecture at UC Berkeley. His first book 194X, is a cultural history of American architecture, planning, and consumer culture in this formative and strained moment for the architectural profession. He also publishes widely on architecture and memory.